Boil pasta, drain and allow to cool. Combine all ingredients for dressing and whisk until well blended. 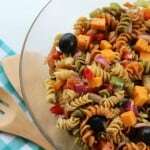 In a large bowl combine all salad ingredients and dressing and toss to coat evenly.